We’ve all heard the term, “shiny object syndrome”. What that typically means is we get distracted by one new thing after another AKA yet another shiny object. We can lose our focus in our business pretty quickly when we are chasing all of these new things. But there are times when the shiny objects can actually be good, and SMART kapp is one of those things. One of the biggest challenges real estate investors face is stepping back out of their business so they can work “on their business” rather than work “in their business”. Once we finally find someone to help us out in our business whether it’s an actual employee or a virtual assistant, it’s quite possible they may work in another location. This leaves us with a brand new problem. We have to figure out how to communicate ideas and sometimes complex strategies to this new team member. I recently came across a dry erase board that will give your growing company a digital makeover. Now be warned, this is not your typical office supplies whiteboard. Not only does this tool allow for better brainstorming with your team members no matter where they are located, but I believe it can actually save you money in the long term by avoiding costly mistakes through “remote miscommunication”. This board captures, shares and saves your ideas digitally. Just plug it in and you are ready to connect. Whether you use Apple or android devices, you simply download the app onto your device. Anyone can join the presentation by simply clicking on a link. 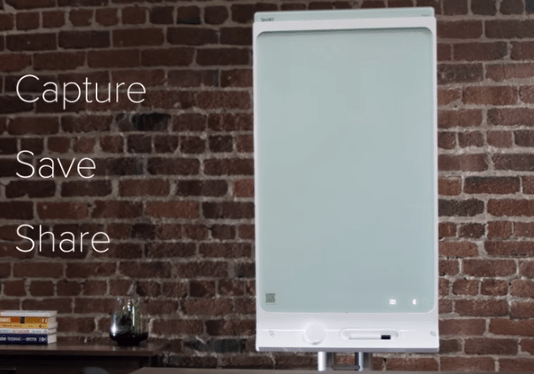 Smart kapp works just like any other whiteboard using a dry erase maker and an eraser. But for anyone connected to the presentation, they are updated in real time on their devices no matter where they are located. You can also save snapshots as PDF’s which allows team members to view changes in the ideas over time. Once you have saved your snapshots not only will you will have a digital record of the entire work flow, you can save them and upload them to most any cloud service for future reference. You’re probably Wondering…. What’s the Price? As you might expect SMART kapp isn’t cheap. The price is around $899 for a 42 inch board, but I did see it advertised a little cheaper online. You can find it at Office Depot if you would rather just go pick one up. I love whiteboards so I love this idea. Whether or not you will find this expense paying for itself in your real estate business probably depends on whether you have team members that work in other locations. But I have to tell you, I actually love the idea of SMART kapp for brainstorming when it comes to building marketing campaigns and sales funnels for my business. How many times have we misplaced our notes after one of these super productive sessions? This device gives you a way to save all of those drawings, graphs and notes related to a particular product or idea. If you’re still not sold, just think about what a fun toy this would be to have hanging up in your office. I like to think of it as a creativity booster. I would love to hear your thoughts on this product, so check it out and let me know what you think.